If you’re planning to see a ballgame next year, make sure to bring an iPhone(s aapl). According to Mashable, the MLB has been working closely with Apple to integrate the iBeacon indoor mapping technology in iOS 7 to create an interactive experience at stadiums around the nation. iBeacons provide a way around this by using Bluetooth as opposed to GPS. Through MLB’s In the Ballpark app and a compatible phone, iBeacons can sense where you are, and provide you with information or promotions. “Essentially, we want to create micro-locations within the stadium where you can get different experiences,” Abramson added. The MLB demonstrated how this could work at Citi Field in New York City. When you’re on you’re way to the stadium, for instance, you can pass through an area that essentially knows you are entering Citi Field. From there it can beam specific information about the stadium to your phone (this information will be customized to each stadium that supports the technology). In the demo shown, the app displays your ticket barcode as you near the entrance, and provides you with a map with your seat’s location. It can also highlight nearby points of interest and can hook into other apps like Apple Passbook to pull up your actual ticket if it was purchased online. 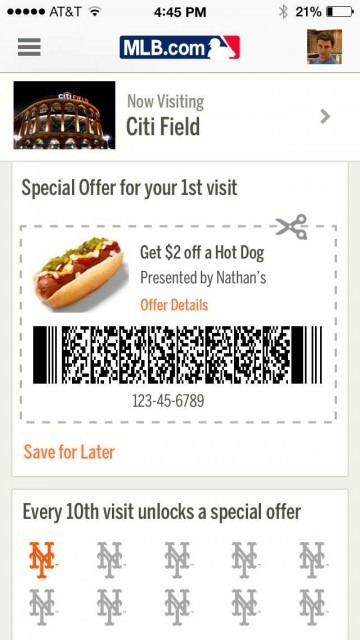 iBeacons can also be used to send out coupons and promotions for nearby vendors, or to create a virtual loyalty card for frequent visitors. The best part is that the experience will be unique every time. “The next time a fan comes to Citi Field, you might not get a prompt to visit the [home run] apple because it knows you’ve been there. Instead, it will highlight another area of the stadium,” Abramson said. This is great for people like me, who usually go to ballgames for the hot dogs and the $9 beer. It provides a much more immersive experience than just sitting in the stands, watching the game. But I imagine this will resonate even more among diehard fans, providing them with a richer, unique experience every time they visit the stadium. This technology will likely go live in 2014. As of now the Mets are clearly in, but there’s no word on other teams that will use iBeacons in their stadiums. anyone know if 3rd party developers can access these beacons as we’d love to integrate them into our http://www.LiveBaseballChat.com app. iBeacons gains MLB, NFC loses Google. Game over.